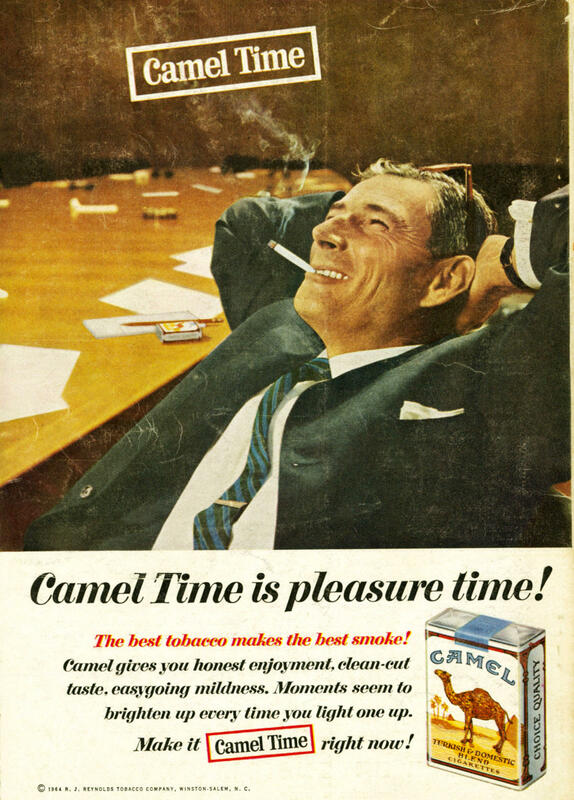 Camel marketed smoke breaks at work as time spent relaxing instead of stressing. Camel, 1964. 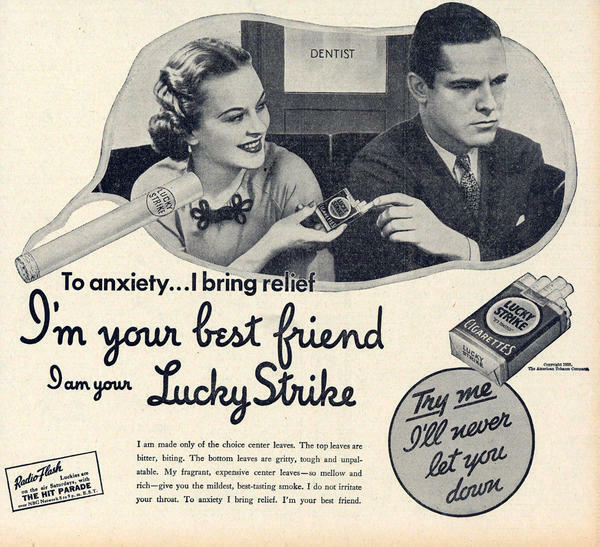 Lucky Strike advertised its cigarettes as an antidote for anxiety. The tobacco industry was particularly interested in the research of scientists whose work suggested that heart disease could be blamed on stress rather than cigarettes. Lucky Strike, 1935. 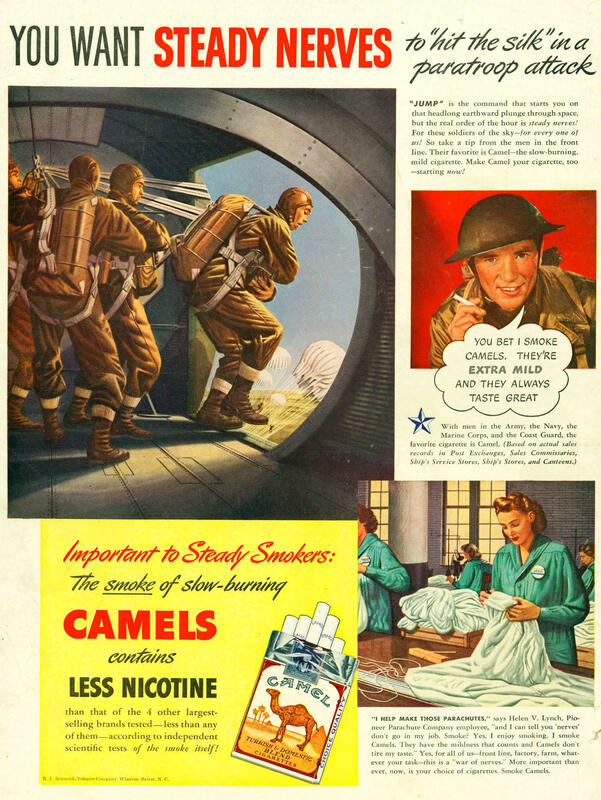 This World War II-era ad from Camel says that smoking cigarettes could be calming in stressful wartime situations, such as jumping out of a plane. Camel, 1942. Some ads claimed cigarettes "never get on your nerves," marketing language that suggested a sedative effect could help smokers in stressful times. Camel, 1940. This ad for Spud cigarettes asks if smokers turn to cigarettes to calm down. If so, Spuds are the solution. 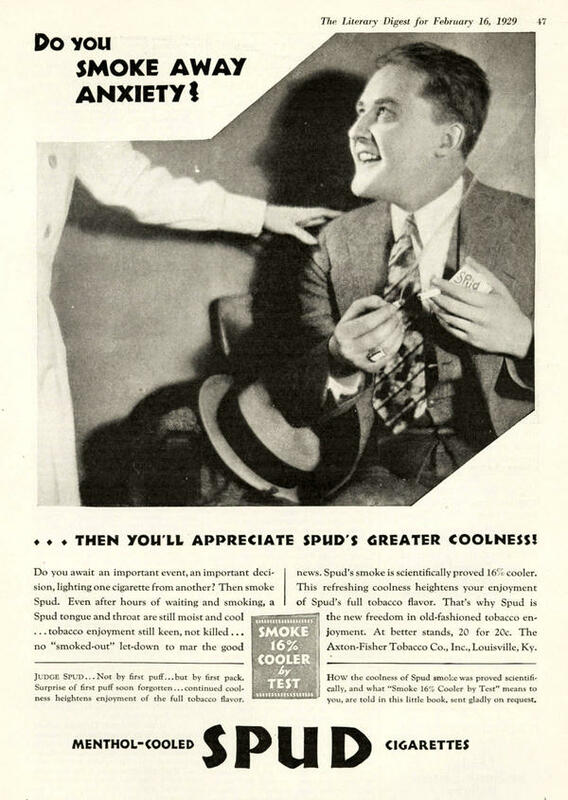 Spud,1929. Cigarettes were also marketed as a reward at work. King Sano, 1959. 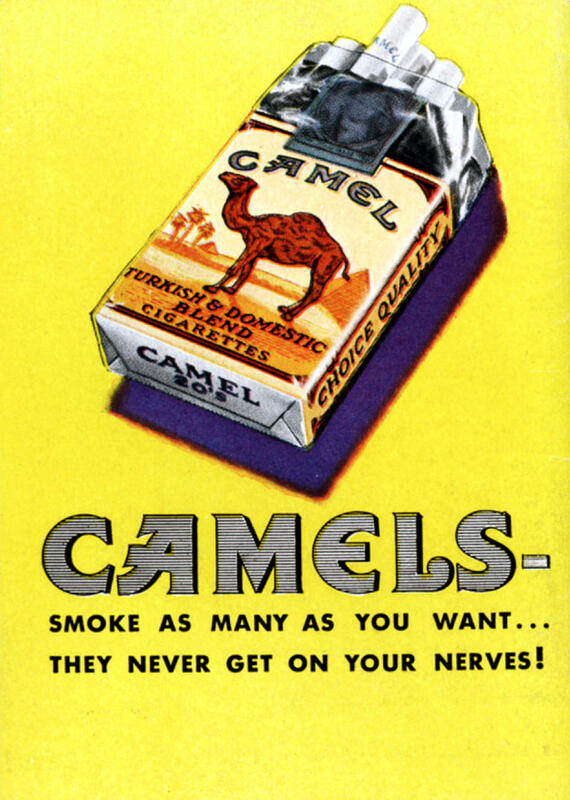 Camel used the confessions of working smokers to show that cigarettes provide a boost during a tiring workday. 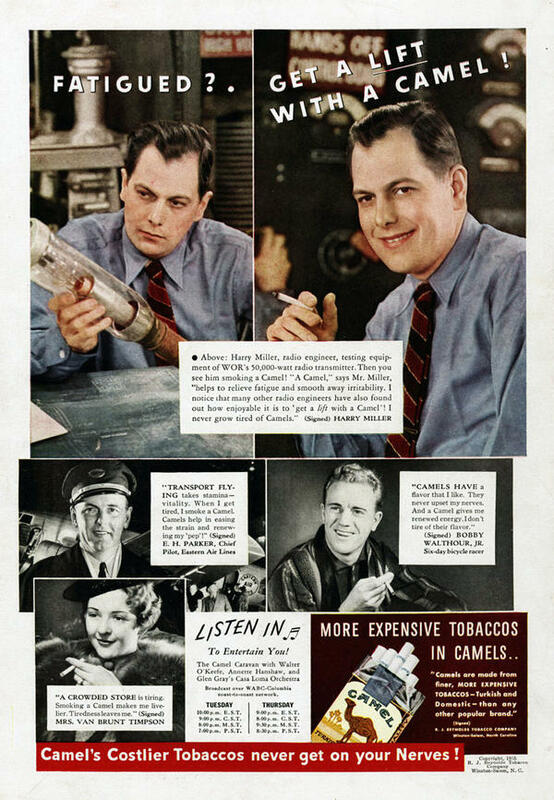 In this ad, a radio engineer is downcast until a cigarette brings a smile to his face. Camel, 1935. At the end of a long week, L&M offered smokers a way to kick back. 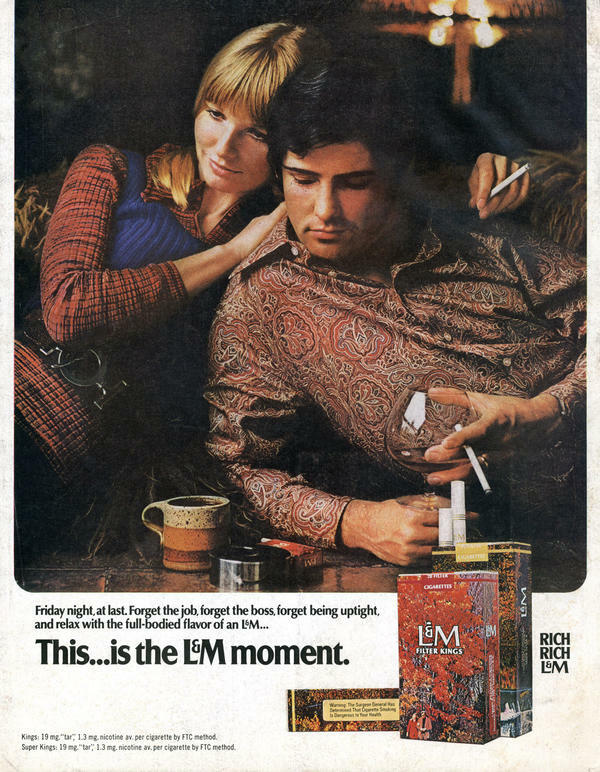 L&M, 1970. Endocrinologist Hans Selye popularized the idea of stress. His experiments with rats showed that prolonged exposure to stress led to physiological changes in the tissue of rats. "Almost universally these rats showed a particular set of signs," Jackson says. "There would be changes particularly in the adrenal gland. So Selye began to suggest that subjecting an animal to prolonged stress led to tissue changes and physiological changes with the release of certain hormones, that would then cause disease and ultimately the death of the animal." And so the idea of stress — and its potential costs to the body — was born. But here's the thing: The idea of stress wasn't born to just any parent. It was born to Selye, a scientist absolutely determined to make the concept of stress an international sensation. "He wrote, I don't know, 1,500 books and articles. I mean, it was a massive, massive output from the man," says Jackson. "He was an incredible man. He only slept four or five hours a day. He was always the first in the lab and the last to leave; his energy was fantastic. Selye went all over the world promoting the gospel of stress." As Selye wrote in his biography, The Stress of My Life (one of 39 books he authored to promote the concept of stress), "Stress will have been my cathedral and I shall polish and perfect it. ... I know my child will outlive me." But Selye wasn't the only high-profile scientist who decided to promote the idea that stress posed a profound danger to health. In the mid-1950s, two American cardiologists — Meyer Friedman and Ray Rosenman — created the idea of the Type A personality. Their argument, essentially, was that there existed in America an entire class of people who lived lives so full of stress and pressure that their bodies were especially prone to disease, particularly heart attack. The doctors published a study that claimed the coronary disease rate for men with Type A personality was twice as high as other men. This idea of a special driven and stress-sensitive subset of personality really captured the American imagination. "You can still see it today," says Mark Petticrew, director of public health research at the London School of Hygiene and Tropical Medicine. "Literally many thousands of websites still talk about Type A behavior in a fairly uncritical way. It still has that grip in popular culture." The thing most people don't realize as they worry over the dangers of stress, Petticrew says, is that much of this foundational scientific research on stress was funded and guided by a very particular sponsor. "What's never really been appreciated is that the tobacco industry was a major funder and stimulant of research on stress," he says. "Specifically Selye's work, but also research on Type A behavior. Type A personality is to a large extent a construct of the tobacco industry." For the past decade or so, Petticrew and a group of colleagues in London have been searching through millions of documents from the tobacco industry that were archived online in the late '90s as part of a legal settlement with tobacco companies. 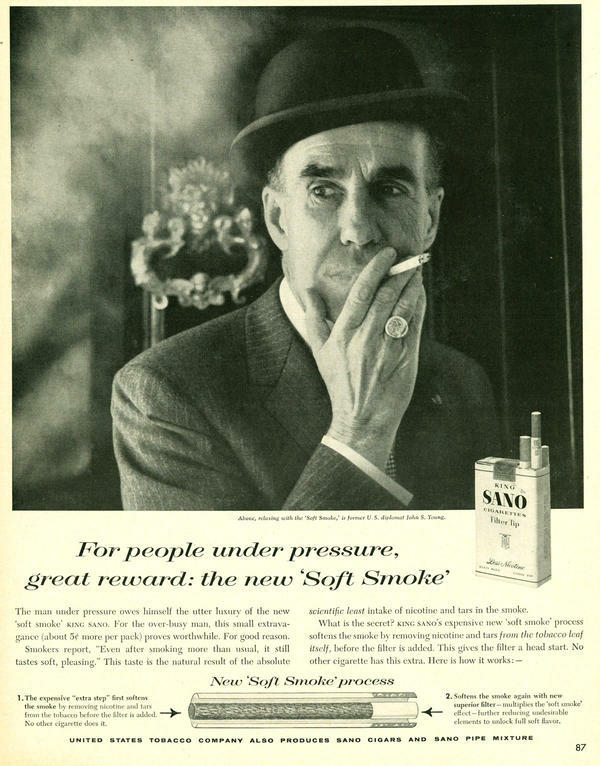 What they've discovered is that both Selye's work and much of the work around Type A personality were profoundly influenced by cigarette manufacturers. They were interested in promoting the concept of stress because it allowed them to argue that it was stress — not cigarettes — that was to blame for heart disease and cancer. "In the case of Selye they vetted ... the content of the paper, they agreed the wording of papers," says Petticrew, "tobacco industry lawyers actually influenced the content of his writings, they suggested to him things that he should comment on." They also, Petticrew says, spent a huge amount of money funding his research. All of this is significant, Petticrew says, because Selye's influence over our ideas about stress are hard to overstate. It wasn't just that Selye came up with the concept, but in his time he was a tremendously respected figure. "Selye was one of the major scientists of the 20th century; he was nominated for a Nobel Prize 10 times," Petticrew says. "So I feel it's impossible and it's misleading to talk about stress without acknowledging the fact that he had a very, very close working relationship with the tobacco industry. And they helped him to shape his ideas, and he helped them to shape theirs." This is also true of the work around Type A personalities and the notion that a highly stressed personality — not cigarette consumption — caused heart disease, particularly in men. Petticrew says that though early studies, some of which were funded by tobacco companies, showed a connection between Type A and heart attacks, as more studies have piled up the original findings of Friedman and Rosenman have been undermined. "There have been very few studies which have actually shown that Type A behavior is a risk factor for illness, certainly for coronary heart disease," Petticrew says. "Of the studies that do show that, and there are only four, in three of them the researchers had some contact or money from the tobacco industry. That's not to say, and absolutely shouldn't be said, that all Type A behavior research is tainted by tobacco money. But it has had a major skewing effect on the field which I think has been completely unrecognized." NPR contacted Altria's Philip Morris tobacco unit, the primary funder of Type A research and also a major contributor to Selye. The company had no comment about the research; a spokesman said all the research happened too long ago. In the years since Selye's foundational work, research on stress has exploded. There's no question that stress, particularly chronic stress in childhood, has a very serious impact on long-term health. But some scientists now argue that our usual narrative of stress — that stress is universally bad for health — is too one-sided and doesn't reflect the reality that some degree of stress can actually benefit people. Stress isn't always a bad thing. From NPR News, this is ALL THINGS CONSIDERED. I'm Robert Siegel. We're beginning a special series today - a series called Stressed Out. NPR, the Robert Wood Johnson Foundation and the Harvard School of Public Health conducted a nationwide poll asking Americans to describe the stress they experience, where it comes from and what they do about it. One key finding is that health problems are a big cause of stress for most of us. We'll hear more about that coming up. But first, how the idea that stress affects our health came to public consciousness in America. NPR's Alix Spiegel looked into it, and she found that the tobacco industry helped launch stress research. ALIX SPIEGEL, BYLINE: The idea of stress began on a rooftop in Canada with a handful of rats freezing in the winter wind. 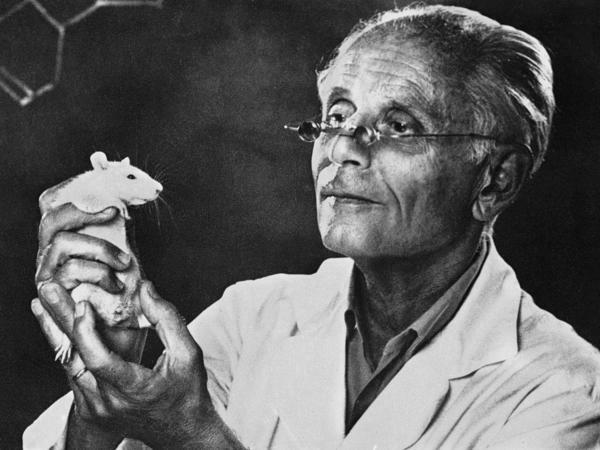 This was 1936, and according to medical historian Mark Jackson, by that point the owner of the rats, scientist Hans Selye, had gotten pretty good at making rats suffer for science. MARK JACKSON: He would make them go hungry for a long period or subject them to extreme temperatures or make them exercise a lot. And then what he would do - he would kill the rat and dissect it and look at the organs. SPIEGEL: See, what was interesting to Selye was that no matter how different the tortures he devised for the rats were - from icy winds to painful injections, when he cut the rats open, it appeared that the physical effects of those very different tortures were always the same. JACKSON: Almost universally, these rats showed a particular set of signs, particularly in their adrenal gland. There would be changes in the adrenal gland. And he began to suggest that subjecting an animal to prolonged stress led to histological tissue changes and physiological changes with the release of certain hormones that would then cause disease, and ultimately cause the death of the animal. SPIEGEL: And so the idea of stress and its potential cost to the body was born. But here's the thing - if the idea of stress had been born to just any parent, you might not, in your lifetime, have heard as much about stress as you have. But it wasn't born to just any parent. It was born to Selye, someone absolutely determined to make the concept of stress an international sensation. JACKSON: I mean he wrote - I don't know - 1,500 books and articles. I mean it's massive, massive output from the man - incredible man. I mean he slept four or five hours a day. He was always the first in the lab and the last to leave. So I mean his energy was fantastic. He went all over the world promoting the gospel of stress. SPIEGEL: As Selye wrote in his biography, "The Stress of My Life," one of 39 books that Selye wrote promoting the concept of stress, stress will have been my cathedral, and I shall polish and perfect it. I know my child will outlive me. But Selye wasn't the only high-profile scientist promoting the idea that stress posed a profound danger to health. RAY ROSENMAN: Type A individuals are individuals who exhibit aggressiveness, ambition, competitiveness, the drive to achieve, the drive to get things done. SPIEGEL: This is American cardiologist named Ray Rosenman who, along with his colleague, Meyer Friedman, helped create and popularize the idea of the Type A personality in the 1950s. Their argument, essentially, was that there existed in America an entire class of people who lived lives so full of stress and pressure that their bodies were especially prone to disease - specifically, to heart attacks. ROSENMAN: Men with a Type A behavior pattern you have more than twice the coronary rate of men with a Type B behavior pattern, as you might very well expect. SPIEGEL: And according to Mark Pettigrew, director of public health research at the London School of Hygiene and Tropical Medicine, this idea of a special, driven and stress-sensitive subset of personality genuinely captured the American imagination at the time. MARK PETTIGREW: And it still does. I mean you can see today, literally many thousands of websites talking about Type A behavior in a fairly uncritical way. It's something which still has that grip in the popular culture. SPIEGEL: The thing that most people don't realize, Pettigrew says, as they worry over dangers of stress, is that some of this foundational scientific research about stress was funded and guided by a very particular sponsor. PETTIGREW: What's never really been appreciated is that the tobacco industry was a major funder and stimulant of research on stress, specifically Selye's work and also research on Type A behavior. Type A behavior is basically, to a large extent, a construct of the tobacco industry. SPIEGEL: You see, for the last decade or so, Pettigrew and a group of colleagues have been searching through millions of documents from the tobacco industry that were archived online in the late '90s as part of a legal settlement against tobacco. And what they've discovered and published in scientific journals is that both Selye's work and much of the work around Type A, were profoundly influenced by cigarette manufacturers who were interested in promoting the concept of stress because it allowed them to muddy the waters by arguing that it was stress and not cigarettes that was to blame for heart disease and cancer. PETTIGREW: In the case of Selye, they vetted papers. They vetted the content of the paper. They agreed the wording of papers. Tobacco industry lawyers actually influenced the content of his writings. They suggested to him things that he should comment on. SPIEGEL: They also funded Selye's research which is significant, again, because Selye's influence over our ideas around stress are hard to overstate - not only because he came up with the idea, but as Pettigrew says, also because in his time he was such a respected figure. PETTIGREW: I mean Selye was one of the major scientists of the 20th century. He was nominated for a Nobel Prize 10 times. So I feel that it's impossible, and it's misleading to talk about stress without acknowledging the fact that he had a very, very close working relationship with the tobacco industry, and they helped him to shape his ideas, and he helped them to shape theirs. SPIEGEL: This is also true of the work around Type A personalities and the notion that a highly stressed personality, not cigarette consumption, caused heart disease, particularly in men. Pettigrew says that though early studies, some of which were funded by tobacco, showed a connection between Type A and heart attacks, as more studies have piled up, the original findings of Friedman and Rosenman have been undermined. PETTIGREW: There have been very few studies which have actually shown that Type A behavior is a risk factor for illness - certainly for coronary heart disease. Of the studies that do show that - and there are only four - in three of them the researchers had some contact or money from the tobacco industry. That's not to say - and absolutely shouldn't be said - that all Type A behavior research is tainted by tobacco money. But it has had a major skewing effect on the field, which I think has been completely unrecognized. SPIEGEL: I contacted Philip Morris to ask about their role in this research. They were contributors to Selye and the primary funder of Type A research. And they wrote back that they have no comment since the research happened long ago. But in any case, in the years since this foundational work, research on stress has exploded. And there's no question that stress, particularly chronic stress in childhood, has a very serious impact on long-term health. But some scientists are now arguing that our narrative that stresses universally bad for health, which was promoted by tobacco, is too one-sided and doesn't reflect the reality that some amount of stress can actually benefit people, and stress isn't always a bad thing. UNIDENTIFIED MAN: This is America today. We live with more tension than ever before. SPIEGEL: Still, the narrative of stress promoted by tobacco through research funding and marketing and educational films like the 1975 film you hear running under my voice - which, by the way, featured both Selye and Ray Rosenman - is, according to researcher Mark Pettigrew, alive and well - surviving, still, from a long time ago when the industry worked actively with scientists to frame how we see and experience stress. MAN: The tobacco industry is concerned about the implications for its products. It believes informed discussion is essential to the public interest. Its dollar commitment to independent scientific research in the area of smoking and health exceeds the combined support of The Cancer Society and the Heart and Lung Associations and is growing yearly as we seek the answers that we need. UNIDENTIFIED MAN 2: The biggest thing we need is more good-quality research. SPIEGEL: Alix Spiegel, NPR News, Washington. Transcript provided by NPR, Copyright NPR.